What would happen if a troll still lived in the diminishing wild around us? 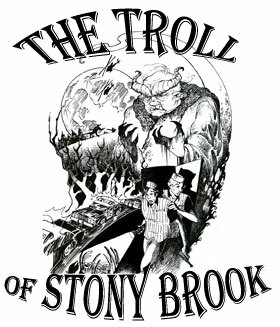 To explore that question comes FinalRune’s new show, The Troll of Stony Brook. An awkward teenager, Jamie, is driving home one night from a party when he hits something – something big. His pushy co-worker, Rick, talks him into going back to the scene of the accident… and what they find will change them both forever. Recorded on location in South Portland and Alfred, Maine the spring of 2010. Additional studio recording courtesy of Mind’s Eye Productions. Additional sound effects courtesy of Mind’s Eye Productions. Special thanks to Matt Morris, video guy extraordinaire.